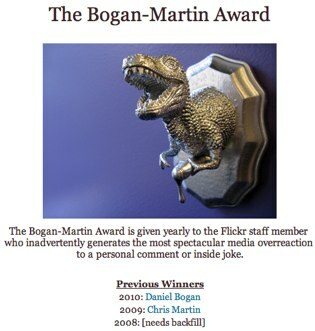 The Flickr Bogan-Martin Award For "Media Overreaction"
One thing you can say about the Flickr team – there’s some fight in ’em. They apparently were not super pleased with our coverage of their annual (and unofficial) Grant-Pattishall Award given each year to the Yahoo engineer who “who breaks Flickr in the most spectacular way.” I’m not sure why, I think the award is fun. So who won? Daniel Bogan this year, who was also this year’s winner of the other award. And last year was Chris Martin. Both winners names link to previous posts we’ve done. Suggesting that we’re the media that is engaging in the spectacular overreaction. Ok, Flickr. You won this round.